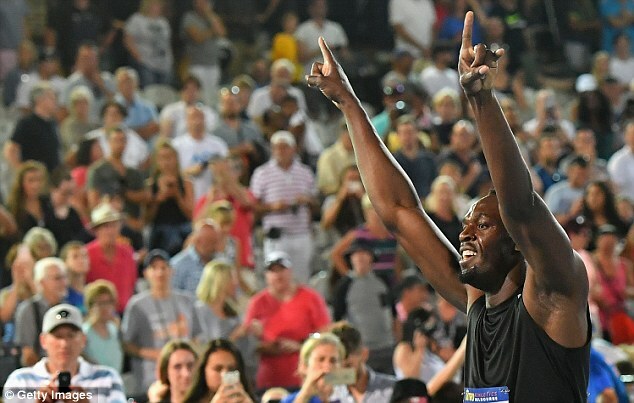 Back on the track for the first time since losing his 2008 Olympic relay gold, Usain Bolt thrilled fans as he helped his All-Stars team to victory in of all events, a relay. In his only event of the night at the Nitro Athletics Series in Melbourne, Bolt took the baton from Asafa Powell and showed everyone what he can do by powering away down the back straight. The Jamaican described the debut of the new event as a promising start. The world’s fastest man was impressed with the atmosphere the 7,000 strong crowd at Lakeside Stadium generated for the new team event. 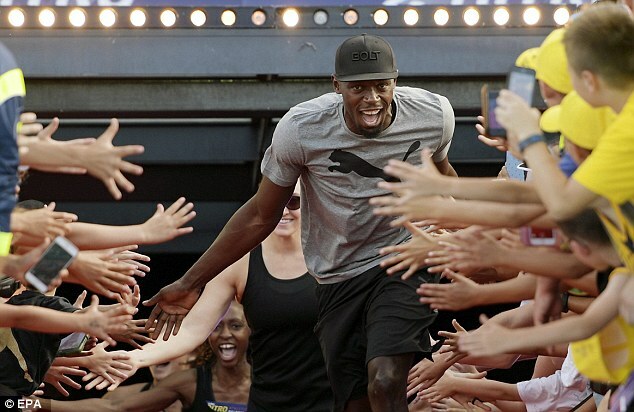 ‘It was a lot of fun,’ Bolt said. ‘The crowd came out and supported and I’m urging more people to come out on Thursday and next Saturday because it’s a great event. 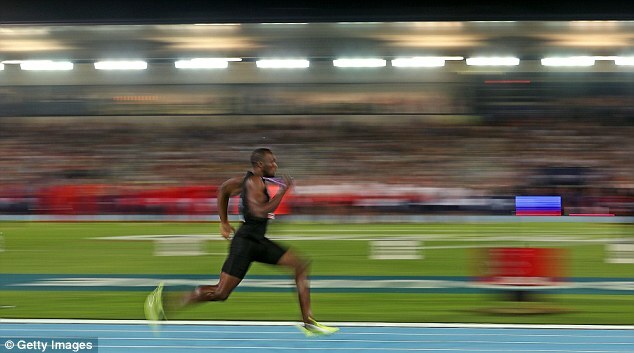 Bolt appeared in the final event of the evening, a mixed 4x100m relay where he ran the second leg opposed to a 16-year-old Australian schoolgirl. 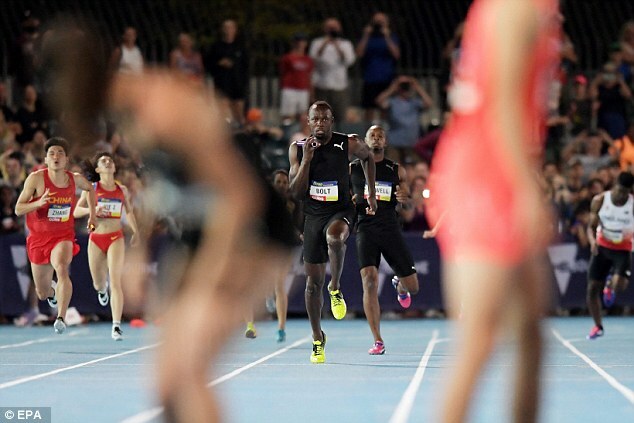 Bolt lined up in the second leg of the mixed relay against three other men and two female sprinters – Mariko Nagano from Japan and 16-year-old Riley Day of Australia. With fellow Jamaican and former world record holder Asafa Powell running the opening leg for the All-Stars, Bolt was always going to get the baton in first place. The gap was much bigger by the time Bolt handed off to Jenna Prandini, although Day was also impressive. 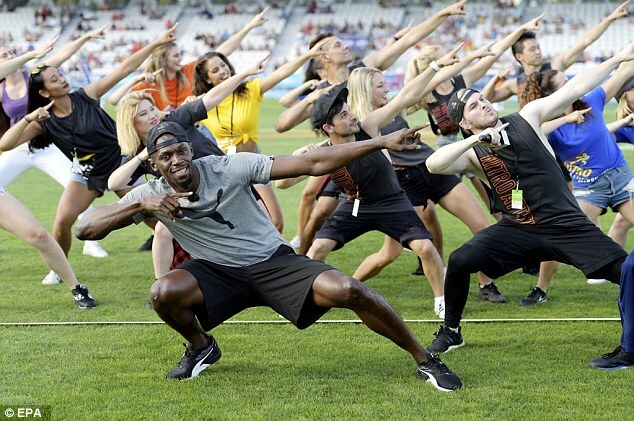 But Bolt and his team easily won the event. Bolt, the eight-time Olympic champion, has committed to competing in all three Nitro events over an eight-day period in Melbourne. The meet continues on February 9 and February 11 at the same stadium. 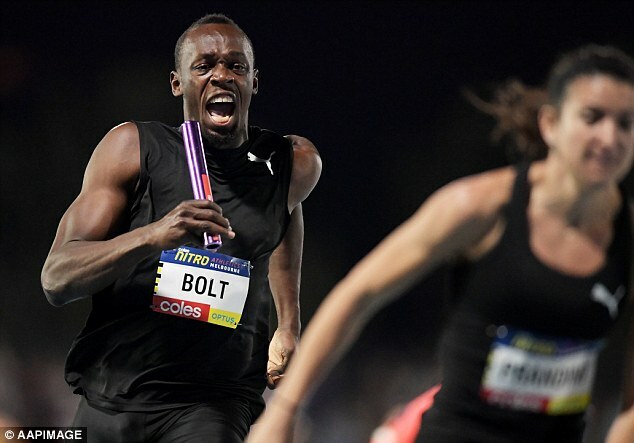 Bolt showed that he is refusing to dwell on the disappointment of losing his Beijing Olympics 4×100 metres gold medal. The Jamaican team saw their result wiped from the history books after Nesta Carter tested positive for a banned stimulant. The International Olympic Committee ordered Carter, who has already said he would appeal the decision to the Court of Arbitration for Sport, and team-mates Bolt, Asafa Powell and Michael Frater to return their medals. 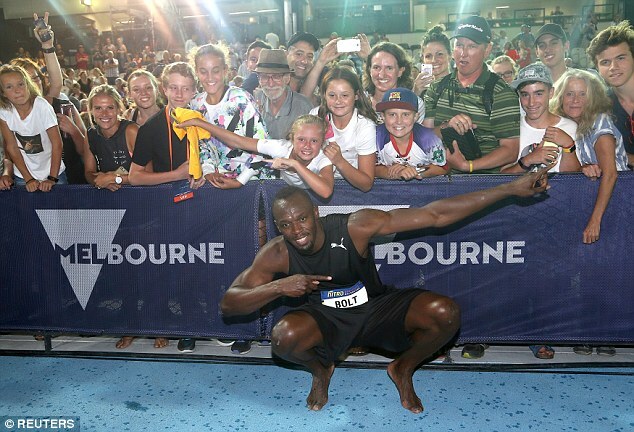 ‘Initially (I was) disappointed, of course,’ Bolt told reporters at Melbourne Airport as he arrived ahead of the Nitro series. ‘But in life, things happen. I’m not sad… I’m just waiting to see what’s going to happen. Also in the Melbourne field are Bolt’s fellow Jamaican sprinter Michael Frater, Rio de Janeiro Olympics 400-meter hurdles champion Kerron Clement and American long jumper and sprinter Jarrion Lawson. Teams from Australia, England, China, Japan and New Zealand, composed of 12 men and 12 women, are also competing in the meet. Events include the mixed medley relays, sprints over 60 and 200 meters, the long jump and the elimination mile, where at the end of the first, second and third laps, the last-place runner is eliminated.